Over the years, computers have become integral to both industry and modern life. As technology has advanced, the PC has become more and more sleek, streamlined and high-tech. This means that the components which make up your computer have had to become smaller in size, yet much greater in terms of speed, power, and capacity. One of the key parts of the computer is the motherboard. Created with the help of chemical etching, it provides the vital communication pathways which enable the rest of the machine to work effectively and efficiently, as well as handling the video circuitry and any connections to external devices. Since the motherboard is such an important component, it should come as no big surprise that manufacturing motherboards is such an intensive process. But how does chemical etching fit into the equation? How is a Motherboard Made? 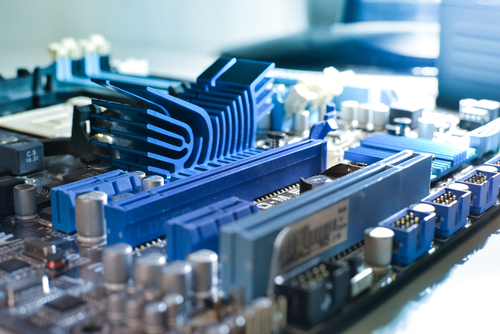 The two main materials found in motherboards are fibreglass and copper. Fibreglass provides insulation whereas copper forms the conductive pathways within the component. During the manufacturing process, a sheet of fibreglass fabric is coated with epoxy resin and heated until the resin is partially cured. This sheet is called prepreg. Multiple sheets of prepreg are stacked to the required thickness to create a laminated sheet. Sheets of copper foil are applied to both sides, before being placed in a heated press to complete the curing of the resin and allow the different layers to bond together. The end result is a sheet of copper-clad laminate. The next stage of the process is where chemical etching comes into play. Photoresist is applied to both sides of the copper-clad laminate, coating the layers of copper. A pattern is then placed over the laminate before the component is exposed to ultraviolet light. The chemicals polymerise when the photo-resist is exposed to the ultraviolet light – the board is immersed in a chemical solution to develop the image. The unexposed photoresist is washed away, and any remaining polymerised portions of the photoresist are etched away. Following this process, the fibreglass board has a pattern etched in copper on each side which will form the basis of the circuit”™s interconnections. Several of these parts will be manufactured and stacked together to create the motherboard’s multiple layers. Holes will then be drilled through the board to bolt it into place in the computer and accommodate through-hole components. A method of chemical etching is then used once again to ensure the board is electroplated. Of course, manufacturing a motherboard is a complex process, and this is only a very brief overview of what is involved in the procedure. For more information about chemical etching and the range of components that we can manufacture using this method, please get in touch with a member of our team.